The Center for Security Policy, the organization headed by anti-Islam conspiracy theorist Frank Gaffney, honored Judicial Watch president Tom Fitton and right-wing author and pundit Eric Metaxas at the group’s annual gala, which was held in New York City on December 3. Fitton received the 2018 Freedom Flame Award, while Metaxas was honored with the Mightier Pen award. The Center for Security Policy has been designated an anti-Muslim hate group by the Southern Poverty Law Center. 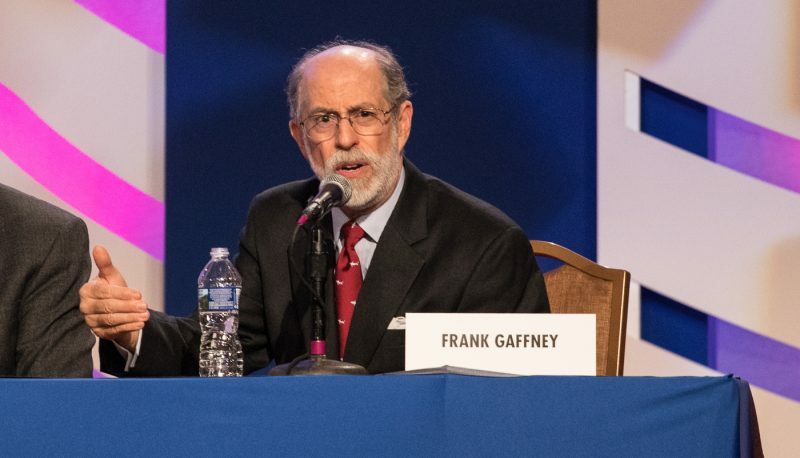 Gaffney is so extreme that he was banned from the Conservative Political Action Conference for a while after he claimed that the group had been infiltrated by the Muslim Brotherhood. He has since been welcomed back, and in 2018 the Center for Security policy hosted a CPAC panel that featured discussion on how to get Muslims to leave the U.S. Last year, Gaffney told Breitbart that mainstream media outlets that fact-check President Trump are waging “information warfare” against the presidency. This Justice Department and the FBI, while it was supposed to be prosecuting and investigating Hillary Clinton, was actually working with her campaign to come up with fraudulent reasons to spy on, investigate and target Donald Trump and his team. There’s no scandal like that in American history—not in the history of the FBI, not in the history of the Justice Department. Metaxas was introduced by National Religious Broadcasters President Jerry Johnson, who quoted a news profile that had described Metaxas as “the happy warrior for a muscular Christianity.” In 2016, Metaxas said that the election was as critical a turning point as the American Revolution or the Civil War. Metaxas, whose books include biographies of abolitionist William Wilberforce, Nazi-resisting pastor Dietrich Bonhoeffer, and church reformer Martin Luther, used similar rhetoric when he spoke earlier this year at a conference sponsored by Christian nationalist David Lane.